PURPOSE: To develop your capacity to turn off the Screaming Noise and Listen to the gentle whispers of your own wisdom. Minute one: Be awake to the screaming money noise – of this moment. Minute two: Fully aware of the noise, what center in your body (head, heart or belly) is most activated? Minute three: Pay attention to that center. What is the texture, the space, the sensations, the felt sense? Describe in one word or phrase or picture. Minute four: Be with your discoveries. Bring a gentle breath to the space. Minute five: What has happened to the noise? Complete your practice by sensing the opening to the whisper of your own voice. 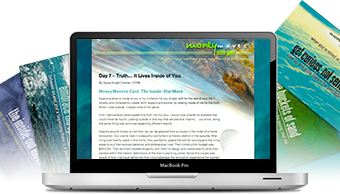 Daily 5 minute Practice: Practice finding your money whisperer once a week in a contemplative space. Each week, write the whispers you hear in your money whisper journal.